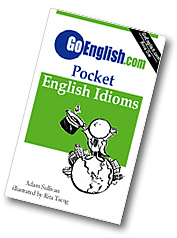 Today's Idiom = "A Piece Of Cake"
Something that is very easy to do is "a piece of cake". Example: "Can you finish your homework in ten minutes?" Reply: "It will be a piece of cake." "A piece of cake" is so easy to do that it is like eating a piece of cake. Example: "How was your test today?" Reply: "It was a piece of cake." You say "piece of cake" to show how very easy it is for you to do something. Example: "I've always had a hard time studying history, but math is a piece of cake." You are very confident that you can do something which you think is a piece of cake. Example: "Do you expect to win your tennis match today?" Reply: "It will be a piece of cake."